The Devaliya Safari Park is situated close to the Gir National Park, the only home to Asiatic lions in the world. NEW DELHI: The Central Zoo Authority (CZA) has blamed the Gujarat Government for illegally operating the Devaliya Safari Park in Junagadh where a forester was killed and two labourers grievously injured in a lion attack on November 30. 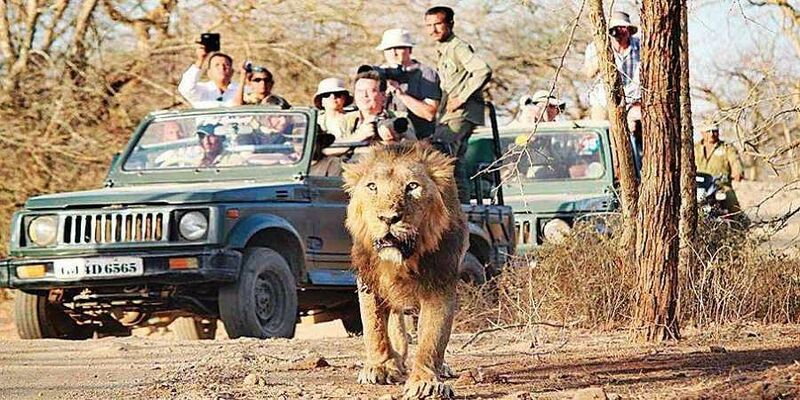 The CZA, which provides permission for running safaris, sent a communication on Friday to Gujarat’s Chief Wildlife Warden, Department of Forests and Environment, seeking to know how a lion safari was being operated in the park. The CZA investigated the incident following a complaint filed by Bhopal-based wildlife activist Ajay Dubey and found that the Devaliya Safari Park had neither taken permission for operating the park nor for running the safari. What is worse, the park had been illegally operating for years. D T Vasavada, Chief Conservator of Forest, Wildlife, Junagadh, admitted that the safari is run by the Gujarat forest department but refused to comment on the CZA notice. The Devaliya Safari Park is situated close to the Gir National Park, the only home to Asiatic lions in the world. “You are requested to inquire into the circumstances leading to death of personnel in the illegally operating safari in Devaliya. Also, it is to advise that appropriate action be taken against the operator for illegally operating safari... as per the provision of the Wildlife (Protection) Act, 1972. Action taken in this regard should be apprised... within 30 days,” CZA Member Secretary Anup Kumar Nayak said in his letter. “This is also to inform you that this office through a series of letters in 2009, 2016, 2017 and 2018, informed the Chief Wildlife Warden, Gujarat that the operation of Devaliya Safari Park, Junagadh is in violation of the law,” Nayak said. Dubey has sought an FIR against the zoo operator. “Officers of the Gujarat government are responsible for the death of a forest employee and the state should lodge an FIR against the zoo operator. I will also be approaching the National Human Rights Commission seeking action against the state government,” he said. As per the 2017 census, there are 650 Asiatic lions in Gir and nearly one-fourth of them live outside the core habitat.